Consumption of alcohol (rice beer & foreign liquor) made life miserable for people from the entire circles of Kamporijo I & II due to rise in (alcohol related) social problems. Kamporijo I & II are a Nyishi dominated area comprising 96 villages in total of which 20 villages are included in the project. These are villages in one of the remotest corners of Lower Subansiri District of Arunachal Pradesh, India. As soon as sun rises in the morning, a large number of inebriated villagers, including man, women, youths, and neighborhood brawls would become a normal sight. The emergence of Church is these areas convinced people to shun alcohol for good & do something good for the community. The Nyishis responded to the call in affirmative. But the problem started when they resorted to drinking of aerated soft drink called Popular soft drink. "We have quit alcohol but we need something to quench out thirst & Popular soft drink looks to be the best among the lot" said Mrs. Tabak Yarin from Yada village. This practice became popular spread like fire in the area since 2008. Nyishis began to drink Popular soft drink in an uncontrollable manner. Starting from child upto adult, no one was an exception. Each household would purchase crates of 2 litre Popular soft drink bottles irrespective of the economic status. Sir, please come for a glass of Popular soft drink was the call from almost every household that Caritas Team visited during May 2014. "I along with my family are almost addicted to Popular soft drink & we don’t mind spending anything for it" said Mr. Tap Tagia, a poor farmer from Bus Camp village. An average poor household of 7 members would need atleast one crate of Popular soft drink for week costing him nothing less than `1000/-. For the well to do family it used to be close to one crate (of soft drink) per day. "Nothing but Popular soft drink gives us the relief when we work in our fields" said Mr. Taw Hali from Bus Camp Village. The farmers would carry little food & more of Popular soft drink as head loads when to go their fields. The story does not end here. Pespi was now used in cooking as well. Most of the households used Popular soft drink in their curries & boiled items as an additive except rice. "We are using Popular soft drink now as a pesticide to save our crops & its working" said Mr. Kabak Bosco from Yada village! Such use of Popular soft drink was taking a bad shape in the society now & some impacts are also showing in the health of the people. On 21st May 2014, Awareness program on harmful effect of consuming aerated drinks especially Popular soft drink was held at Boasimla village. The entire circle of Kamporijo I & II was infamous for the huge quantity of Popular soft drink it had consumed. The awareness camp highlighted the ill effects of the Popular soft drink & urged the community to avoid such aerated drinks. It was only collective action of the community thereafter that the shops operating in the village had to stop bringing Popular soft drink as there are no buyers in the village and the drinking habit of Popular soft drink in the village also declined considerably. "We resolved in our village council meeting that from now on we would impose fine upto Rs 5000/- on those who try to sell Popular soft drink in & around our village" said Mr. Tap Tapuk, Zila Parishad Member (ZPM), Boasimla. Today, the Nyishis of 20 project villages under Kamporijo I & II have realized the evils of Popular soft drink. Farmer, SHGs and students of Kamporijo circle, came together and supported Itanagar Diocesan Empowerment Association (IDEA), started a community-based awareness on harmful effect of consuming Popular soft drink was launched in every village. The women, man and youths belonging to the Nyishi tribe, understood that Popular soft drink is the drink which leads to the damage of immune system and harms our body especially the pregnant women and the baby which is nourishing in the mother’s womb. If the pregnant women consume "Popular soft drink the throat of the baby is being affected in the womb itself & as a result baby starts coughing almost immediately after birth" said Mrs. Taw Tajik, a nursing mother from Boasimla village. 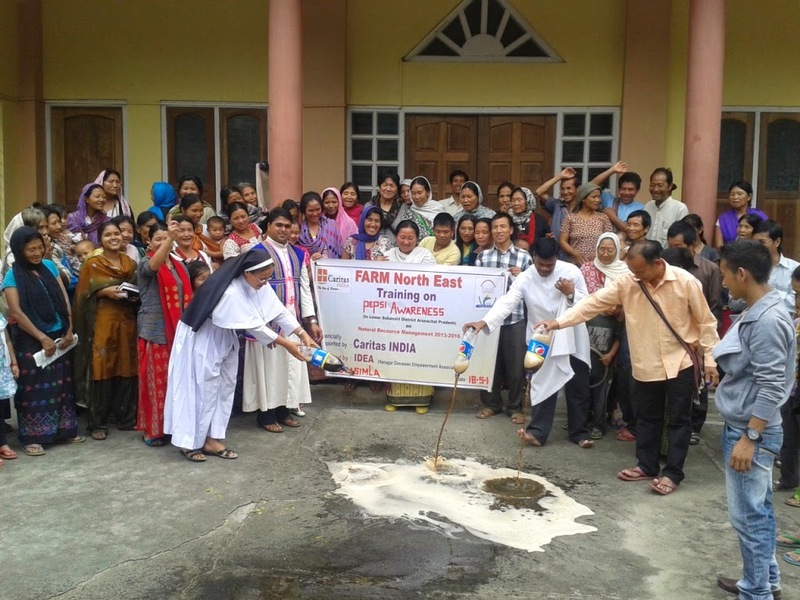 They also realized that Popular soft drink was spreading entire state of Arunachal Pradesh at an alarming rate. Today after eight months since the awareness programme we could see that 75% of people in 20 Project villages (Total population-4442) of Kamporijo I & II have quit Popular soft drink. This happened due to strong determination of the people in those Circle. Taking cue from our success, the State Department of Health & Family Welfare also gave awareness camp on Popular soft drink at Naharlagun General Hospital in the month of January 2015. Today people of Kamporijo I & II realized their strength and they are encouraged by their success, and decided and took resolution not to allow any sort of harmful products to be sold or used in their villages. The Nyshi people are in the process of having achieving their dreams of free Popular soft drink in Kamporijo I & II. "We almost killed ourselves through unlimited consumption of Popular soft drink but thanks to IDEA for timely intervention & saving our community from an inevitable disaster" said in general by the people of the Kamporijo I & II.